If you are looking for a teaching career to take you somewhere more exciting and exotic, teach in Egypt! Teaching in Egypt lets you experience life in one of the world’s most exciting and cosmopolitan cities. Year 2 Primary Teacher - International Teaching Job in Egypt. One of the best schools in Egypt require a solid all round teacher of Humanities for August. Teaching Jobs Abroad - Egypt Year 1 Teacher - Contract Commencing August. Teaching Jobs Abroad - Egypt Early Years KG Teacher - Contract Commencing August. Are you seeking a teaching job abroad in Egypt for August? 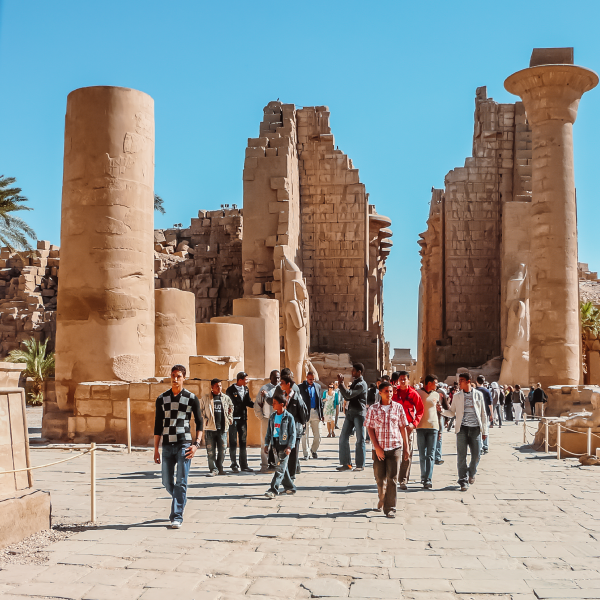 The Arab Republic of Egypt, the land of mighty pyramids, mythical god kings, enigmatic sphinxes and Cleopatra, is located on the northern tip of the African continent. It is also connected to the Asian continent via Sinai Peninsula, a 23,500 sq. mi2 (61,000 km2) land bridge that is also the site of the Suez Canal. The country, which is one of the six independent cradles of civilisation, is bordered by three countries (Israel on the northeast, Libya on the west and Sudan on the south), as well as the Mediterranean Sea on the north and Red Sea on the east. Egypt is the third most populous nation (96 million) and the second largest economy (£248 billion) in Africa. Its political and economic influence, however, transcends socioeconomic numbers. Egypt’s cultural influence has shaped Mediterranean, Middle Eastern and northern African countries for several millennia. Islam (Sunni) is the major religion here, accounting for 90 percent of the population. However, there is also a significant number of Coptic Christians, numbering at approximately 10 million people. While Arabic is the primary language, the majority of the urban population speaks English or French. The currency is called the Egyptian pound, which consists of 100 piastres (or 1,000 milliemes). The public school system is generally looked down upon, so most people who can afford it send their children to private schools. As such, there is a great demand for foreign teachers, particularly native English speakers, especially in major Egyptian cities like Cairo, Alexandria, Luxor and Giza. While private schools and international schools offer the best employment opportunities, many experienced English as a Second Language (ESL) certified-teachers have established booming language schools here. Foreign teachers are even sought for teaching positions at pre-school level. The low cost of living: To put it simply, the cost of living here is two-thirds of that of Britain. Work Culture: Teachers are not expected to bring their work home for grading or preparatory work. Friendly Locals: The locals are extremely friendly, especially to expatriates. You will become the centre of attraction at shopping malls, restaurants and markets. Egyptians are quite class conscious, children from wealthy families tend to attend the top schools in the country which are often British International Schools. Please note that to work in Egypt, you will require a work and residence permit on top of an entry visa. Applications are usually made by employers, but bureaucratic inefficiency usually drag the process into months, so please make suitable allowances prior to making moving arrangements. Working Hours: Around 35 hours a week / 7.30 a.m. to 3.00 p.m., Sundays to Thursday. Private schools typically start an hour later. As far as attires are concerned, Egypt has no compulsory dress code. However, this is a conservative Islamic nation, so women should dress appropriately. Loose trousers and long skirts are perfectly acceptable, but cleavages are not. Also, use sunglasses when walking around as looking men in the eye is considered a form of flirtation by some. It is advisable to carry a pashmina around in case you have to enter into a government building or attend a public function. Do not travel alone at night as women are frequently harassed here. Alcohol is freely available to foreigners. However, take care not to drink in public, especially during the month of Ramadan. Important: Egypt has strict drug laws. In November 2017, a British woman, Laura Plummer, was arrested at the Cairo International Airport for bringing in painkillers meant for her husband. She is now facing the prospect of up to 25 years in jail or the death penalty. Climate: Egypt enjoys a temperate Mediterranean climate. However, the weather is significantly warmer in the southern region near the Sahara desert, where the temperature can rise above 40 °C during the summer months. Visa: A 30-day entry visa can be obtained on arrival in Egypt. However, applications for a work and residence permit can only be made with a written job offer.